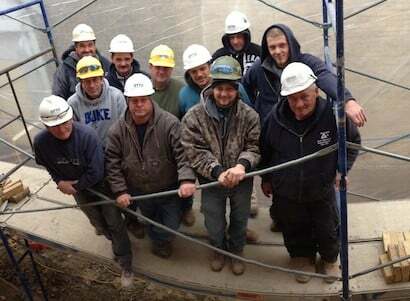 Our crew of hard-working masons continue to work despite the cold because the site is wrapped in heavy-duty weather protection and the heaters are permitted to run day and night. 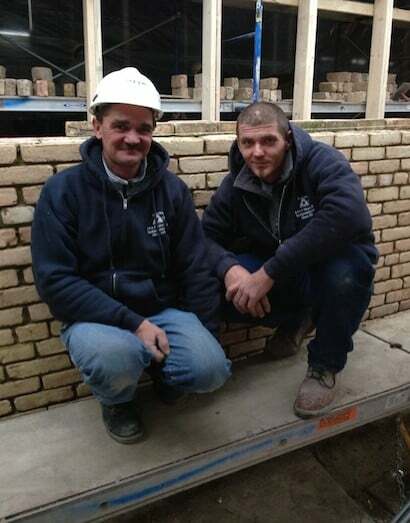 Peter and Mark stand in front of their freshly-constructed foundation wall despite the freezing temperatures outside. Ambient temperature inside the protected work site remains constant at 50 F.
This week's Arctic blast of unseasonably cold weather has brought night time temperatures down into the teens — and that's before the windchill gets factored in…that's cold! Historically, this part of Illinois doesn't experience consistent hard freezes until early December, so the unseasonably cold weather has caught many masonry restoration companies by surprise. Some masonry companies add anti-freeze to reduce the freezing point of the water in their mortar, or they add accelerants to the mortar to make it dry faster. Unfortunately, both strategies lead to a finished product whose bonding properties, resistance to wind-driven weather, and overall longevity are compromised—sometimes severely. There are only two ethical ways a masonry company can accommodate colder temperatures—either heat the job site day and night until the mortar cures, or suspend the project until the spring when night time temperatures rise out of the danger zone. Many masonry companies heat their job sites with liquid propane or kerosene while they are working, and then take their heat source home with them when they pack up for the day. This leaves the curing wall vulnerable to sub-freezing temperatures at night when temperatures are likely to be the coldest. Not a wise strategy. At a current job in Carpentersville, AAA-1 Masonry & Tuckpointing is continuing to rebuild 100-year-old brick walls despite the cold because the owner has elected to tarp in the work area and run two natural gas heaters day and night (the heaters are hard-piped to the building's gas line). Remember, the temperatures which matter the most are the night time temperatures (i.e., the coldest part of the day/night cycle). Temperatures which dip much below 26 degrees will have a deleterious effect on the curing mortar's bonding properties, resistance to wind-driven weather and longevity — unless the job site is heated day and night until the mortar has cured. To learn more about our honest approach to masonry restoration work, please give us a call or send us an e-mail.